Let's start by talking about the actual flowers. I don't believe in using low quality blooms in our arrangements. I make sure that each flower I choose is the absolute best I can find, and sometimes I go to extreme lengths to make that happen. Naturally, high quality blooms come at a higher, constantly changing price. I sometimes compare the price of flowers to the stock market because the prices changes so often. For example a rose that cost $2 a stem this month, may have jumped up to $4 - $6 a stem the following month. When available I like to use local products, but majority of the time the flowers are flying in from all over the world. The actual cost of the flowers is unfortunately not something we have control over. Designing doesn't begin when the flowers arrive and it's time to arrange right before the wedding, but rather it starts the moment we receive the client inquiry. I spend a lot of time getting to know my clients floral vision by starting with a phone consultation followed by several in person meetings. There are so many different styles of bouquets, centerpieces, ceremony arches, etc that I could create, it would almost be impossible to quote without an in depth conversation first. Once I feel we have a good idea of the vision and style, I put pen to paper or fingers to keyboard (lol) and begin to put together a proposal. These proposals on average take anywhere from 4-8 hours to create. My proposals are full of images and details so you have a clear picture of the product and services you are receiving from me. Flowers don't arrive ready to go with all the stems cleaned, and with leaves and thorns removed (I so wish they did!). Instead that is all work that has to be done in my studio. For an average size wedding, I usually need at least 3-4 people just processing the flowers. This means we literally have to clean every single rose, hydrangea, peony, etc that we unbox. That is hundreds and hundreds of flowers! In order to keep the flowers in pristine condition we need to make sure that no bacteria comes in contact with them. After each wedding we scrub every single flower bucket to make sure they're clean before we place any new flowers in them. On top of this, we use several different high quality flower food solutions that go in our water to make sure our flowers are the freshest. Processing flowers is a job in itself, taking up a whole days worth of work (8-12 hours). Honestly, next to the actual arranging I think the processing is my favorite. It's so fun to go through every single bloom, seeing all the unique beauty I get to work with! Ahhhhhh, my favorite part! Now that the flowers are processed, they are ready to be placed together to create a beautiful bouquet, arrangement, etc. The time spent on actually arranging the flowers is the most labor intensive. A standard low arrangement on average takes anywhere from 30 min - 1 hour to put together. A tall lush arrangement takes much longer, over an hour, sometimes 2 depending on size and flowers used. But the centerpieces themselves are not what takes up the most time, bouquets are! A bridal bouquet takes the longest to put together because of the amount of blooms I have to hold and arrange in 1 hand! The bride carries her bouquet with her all day through photos, ceremony, and the reception, so I always spend the most time here making sure it's perfect for the whole day. Most often I will spend all morning working on the actual bridal bouquet. Because I am working with a perishable item, I want to create all of the arrangements as close to the actual wedding as possible. I always begin arranging the day before the wedding and I work through the entire evening. It is not uncommon for me to be up until 3:00am - 4:00am! I usually get a few hours of sleep, and wake up to arrange the bouquets and boutonnieres. I do this because I want to make sure your flowers are fresh, long lasting, and beautiful throughout your entire wedding and after! I wasn't kidding when I said I don't believe in low quality! The last piece of the puzzle is delivery, set-up and tear down. Depending on the size of the wedding I may need to rent a larger van to transport all of the floral decor. Packing everything up is no easy feat! We have to carefully wrap, and secure each arrangement to make sure it doesn't get damaged during transport. Each vase needs to be wrapped in bubble wrap and packed securely to ensure nothing breaks during transport as well. It always feels like we're playing a game of Tetris when we start packing up the vans, like what is the best way to load everything up so everything is secure, and easy to unload later. Once we arrive at the venue, the set up begins. We will spend anywhere from 4-8 hours at the actual venue setting up, again depending on the size of the wedding and floral decor. Once everything is set up our job is not done yet! When all guests are heading home after an amazing reception, we return to begin tearing down all decor! Creating the beautiful arrangements, and bouquets you see involves much more than just the flowers. We use all types of different flower foods to keep the flowers as fresh as possible, and not to mention all of the floral foam that we soak in it to create these lush arrangements! All centerpieces need a vase, and in those vases we need floral foam, or floral wiring, secured with floral tape! Candles are also not cheap, and we wouldn't buy cheap ones anyway! We spend the extra cash on high quality candles that don't create dark black soot around the top of the glass. Not only does it degrade the look of the vase over the course of the night, it's also not something you and your guests would want to breathe in. Not a good look! A florists work doesn't begin the day of the wedding. It includes many hours of designing upon initial inquiry, a full week to prepare, process, and arrange. It doesn't even end until the following day when everything is put away, and all rental items are cleaned! I pride myself in creating stunning arrangements with high quality and unique blooms to give you a magazine worthy event! 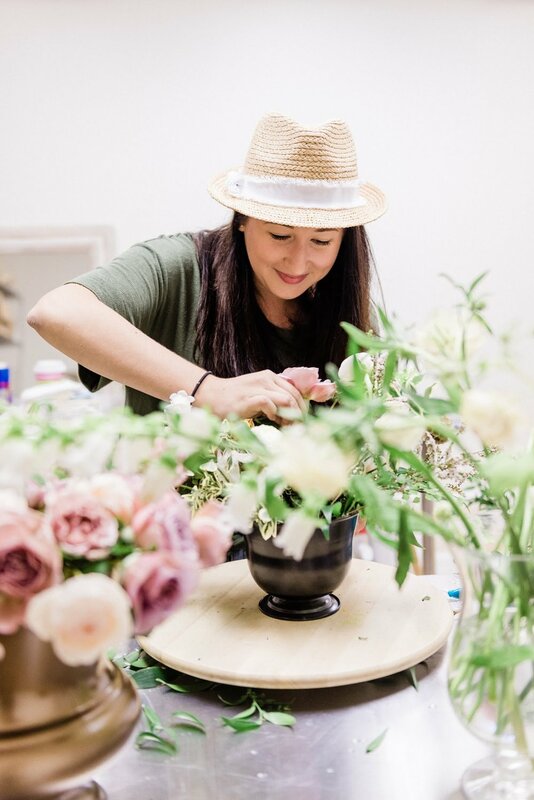 I hope this post was able to provide some insight into the cost of floral arrangements and the processes that help create your one of a kind wedding. I'd love to hear your thoughts on this topic. Share in the comments below!